My husband said this was the best soup I've ever made. He is a man who is brutally honest when it comes to giving his opinion on whether he's a fan of a recipe or not, so I assure you, this soup was gooooood. I think what makes it so delicious is the fact that it uses simple, real, whole ingredients. Meat, fresh vegetables, and just the right touch of seasoning. Would you beleive this was the first time I had ever made use of a hambone in a soup before? I know, I know...crazy, right? I don't know what I was waiting for. It's a sin how many bones I've thrown away over my life! It felt good to be utilizing and getting tons of flavor out of something I would have otherwise tossed in the garbage. I made some salt and pepper croutons out of some homemade Peasant Bread (My Mom's suggestion. Thanks Mom!) 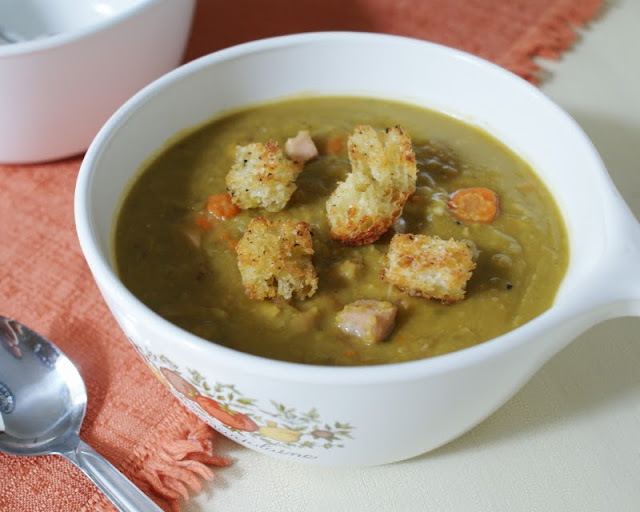 and they were they perfect garnish for this rich, comforting, flavorful soup. Rinse split peas and remove any foreign debris. Source: Adapted from a Whole Foods Market recipe. I pinned this for the slow cooker giveaway. Perfect recipe for fall! I definitely want to try this one! 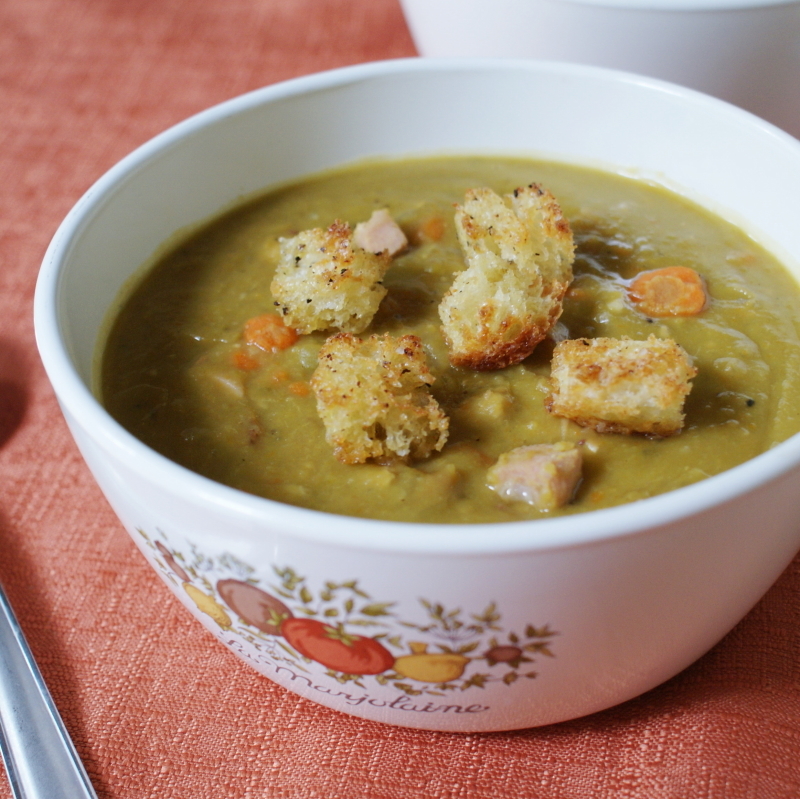 I just discovered split pea soup last year and now it is one of my favorite meals. I would love a slow cooker version that I could start early in the day and have waiting for me when I get through helping the kids out with their homework. It is just starting to feel like fall where I live, and that means it's soup season! Found this recipe via a search on Pinterest and made it today. Yum!! The other versions I've made were vegetarian...I should have known that ham would make this awesome! :) So far my five year old and I are the only ones to try it, but we really love it!